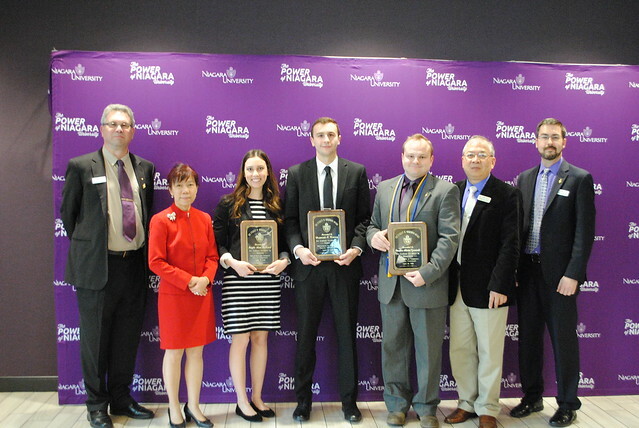 Niagara University business students were inducted April 24 into Beta Alpha Psi and two other honor societies, Omicron Delta Epsilon and Beta Gamma Sigma. Niagara University’s College of Business Administration inducted students into three separate honor societies during a ceremony held April 24. Twenty-eight were inducted or recognized as graduating seniors of the Lambda Chi chapter of Beta Alpha Psi, the international honorary and service organization for accounting, ﬁnance, and information systems students at AACSB- or EQUIS-accredited universities. Beta Alpha Psi provides opportunities for the development of technical and professional skills, participation in community service, and interaction among students, faculty, and professionals. The five newest members of Omicron Delta Epsilon, the international honor society for economics, were also inducted during the event. Omicron Delta Epsilon is one of the world’s largest academic honor societies and promotes recognition of scholastic attainment in economics, as well as emphasizing the professional aspects of economics as a career field. Twenty-six students received membership in Beta Gamma Sigma, the highest recognition a business student anywhere in the world can receive in an undergraduate or master’s program at a school accredited by AACSB International – The Association to Advance Collegiate Schools of Business. Inductees have been selected from the top 10 percent of the college’s seniors, the top 7 percent of juniors and the top 20 percent of MBA graduates for the 2017-2018 academic year. For more information on Niagara University’s business programs, please call 716.286.8050 or visit www.niagara.edu/business. Photos by Taylor Lilton, an NU sophomore studying criminal justice.